A survey released today confirmed what many business owners and entrepreneurs already know - California's business environment will be a major hurdle to overcome if the Elk Grove City Council hopes to fulfill its promise of recruiting 25,000 new high-paying non-retail jobs to the city's Southeast Policy Area (SEPA). 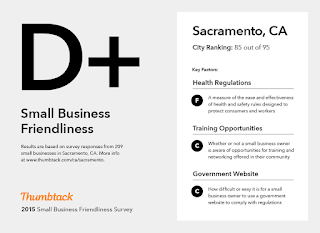 The survey, conducted by Thumbtack.com, found that California was ranked 46th out of 50 states in terms for friendliness toward small businesses earning an F grading. The survey was conducted from data collected from over 18,000 small businesses in 50 states. Respondents in Texas, New Hampshire, Utah, Louisiana, and Colorado respectively gave their states the highest rating for friendliness to small business. Small businesses in Manchester, Dallas, Richmond, Austin, and Knoxville gave their cities the highest ratings. In contrast, small business owners gave California, Connecticut, Illinois, and Rhode Island an "F," while Massachusetts, Maryland, and New York earned a "D" grade. Providence, New Haven, Buffalo, Albuquerque, and Hartford were the survey's worst­-performing cities as rated by their small business owners. As far as California goes, here are business owners rankings of cities/regions within the state - the Sacramento region placed 9th of 10 California cities/regions and earned a D+ rating. Elk Grove City Council Members and staff on the city's executive team, including the economic development office, declined to comment on the survey and how they mat try to to overcome these hurdles. According to the City of Elk Grove's recently approved plans, the 1,200-acre SEPA employment-oriented development is expecting to attract 25,00 new high-paying non-retail jobs to the city as the area builds out. The first phase of SEPA, a 1,100-house development was recently unanimously approved by the Elk Grove City Council. "In general the state has built a reputation in this space that sort of spirals out of control. I am not sure what the local government is doing for small business that would be impactful after you calculate labor laws, workers compensation and tax issues. I have copied our head of Reserach to see in a precursory look if their is something that matters. Local government can be less frustrating but the state drives the environment overall." A copy of the survey's full methodology and analysis paper is available upon request. Please email Thumbtack's Chief Economist, Jon Lieber, at jon.lieber@thumbtack.com for a copy of the paper and with any questions or comments you might have. May be all of those businesses that Mr. Broome plucked from California to Phoenix, he can pluck them back! What I can’t understand when the Elk Grove City Council talks about economic development and bringing jobs to Elk Grove – and what I believe is right in front of us and has been a strength for years – is why the Council isn’t considering agriculture-based economic development. With the farm to fork movement and all the jobs associated with agriculture industries in the farm, agricultural services, and food manufacturing sectors, the Council should at least be exploring this industry which would be perfect for Elk Grove. All the cities in the region are clamoring for the big employers. But the employment benefits associated with expanded food manufacturing output could be a robust market for Elk Grove. Studies show that food manufacturing exerts one of the highest employment multiplier effects of any industry. And one thing will never change: We will always need to eat! His April 28th comment to the SacBee was "Doan said he is looking forward to “aggressively” pitch Elk Grove to corporations, in a bid to solve the city’s jobs-housing imbalance". The answer to Elk Grove's economic success is found inside the city limits, not outside. We need leaders that recognize this reality and find a way to ignite it. 25,000 jobs? Yeah. Riiiight. With all due respect, this article links two subjects that are marginally related. It is well known that the State of California provides a difficult environment for small business. What happens on the local level can be very different. However, in many respects, they are not directly related to what is in the report. Many communities outside Sacramento...actually CA, have a Farm To Fork event yearly. Why can't we have one, maybe call it Farm To Fork Picnic and hold it at Lent Ranch. We even have local chefs with the expertise and many volunteers who would help with it. Seems we (City) have a problem thinking "outside the box" and let outsiders guide our thinking process. When a community is not involved in making this a great city it is on a course to being a failure. There is so much knowledge in this city and yet our council has managed to cast them aside. Yes, Anon 12:49, throwing numbers around has no meaning at all. It's nothing but FEEL GOOD talk with nothing to back it up and we taxpayers are well aware of that. Numbers don't make a city! I could accept that California is a tough environment and give the topic a shrug but how can one explain job growth in West Sacramento, Rancho Cordova or Roseville? If California was so damned tough, things should be tough all over,, right?! We can talk about EG not having executive housing, a nice "view" or any number of things but what we clearly do not have is a strategy that is built on our strengths. We need leaders who understand this and stop trying to make EG into a "destination city" with water parks and stadiums - what a waste of time and money. We need leaders who understand that the strength of Elk Grove lies within and stop the relentless quest for outside validation from "big" companies. While we wait a couple decades for 25,000 jobs to come in, we can and SHOULD invest in the businesses and ideas we have here TODAY. As for a Farm to Fork event, we do have one that is in its second year (Sunday Supper at the Ranch) and benefits Project RIDE. Tickets are still on sale. Prices are at the higher end. Is there one for the Everyday Joe? Not that I know of but this would be a good idea for next year. When I watch City Council meetings I feel there is this separate conversation going on between them and this other community conversation going on elsewhere and never the two seem to meet or even acknowledge the other. Really, the two conversations belong together at the same table. Can that maybe happen again in the near future? Three or four years ago we had this great, what can I call it....community spirit maybe. Somewhere along the way we lost that and it's now like US against THEM! We lost something very valuable and that can prove to be very costly for us all. I agree. That is my point. Why bring up the difficulty in doing business in CA if you are trying to make a completely separate point. The two are not necessarily related. The City is improving but it takes a while to turn the ship around.